If you do not wish to vote at this time, click here to visit La Cosa Nostra stats. 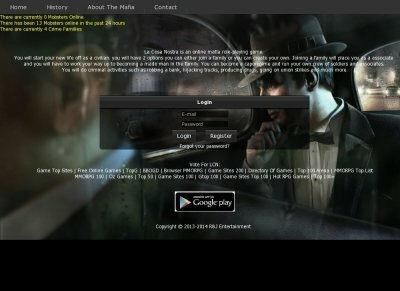 La Cosa Nostra is the most realistic mafia game on the internet. You will start your new life off as a civilian. you will have 2 options you can either join a family or you can create your own. Joining a family will place you as a associate and you will have to work your way up to becoming a made man in the family. You can become a caporegime and run your own crew of soldiers and associates. You will do criminal activities such as robbing a bank, hijacking trucks, producing drugs, going on union strikes and much more.